Oh yeah, I definitely have three favorites! The photo below shows the colors in the Backstage Pass Collection. Massive glitter, not only in the amount, but also in the size. The surface of these feels waaaaaaay smoother than I imagined. Fame & Fortune looks like Massini/Studio M Slammin' Red (aka Forsythe Cosmetics aka Color Club) on steroids! The Foiled Collection shades all have metallic/foil finishes that look to be smooth and streak-free, which is always a relief. Some of these collections are starting to show up now at various eTailers, and there are two more collections that I'm aware of which should be out in the coming months from Color Club. You can view all five of these collections here. Im so excited for these! I order a bunch off ebay cause none of the beauty supply store in my area have them yet. I'm excited for backstage pass, I'm going to a concert next week and I think it'll be the perfect occasion to wear it! The foiled collection is awesome! I'm sooo excited for these. 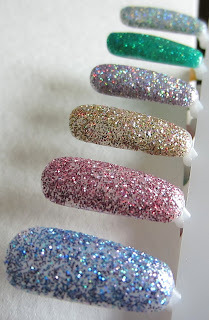 I really, really like the way Color Club does glitters, they're usually so smooth! I'm SO glad for the previews, Mary. My heart beats for those glitters!!! I love these collections. I'll probably be buying them all! Gah! I want them all. Odd these would have so much of a matte coat I like them shinny best. 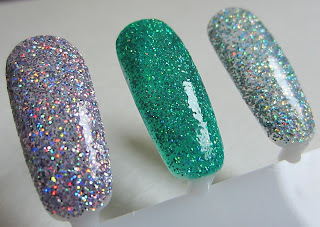 Forgot to say - I think this is the first Xmas collection of all to come out for swatch reviews from bloggers - am I right? I think I agree with you, the last 3 are gorgeous!